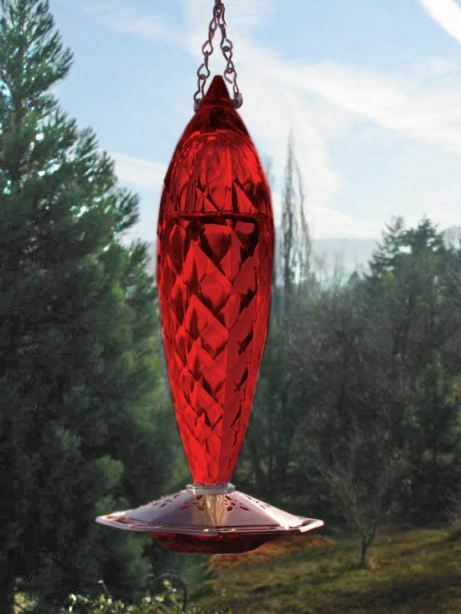 The teardrop shape and ruby hue gives this hummingbird feeder a fabulous jewellike look, Made of handblown crystal. The hummingbirds at our store love this feeder and many of our customers have bought seconds and thirds of this feeder. Nectar reservoir screws off base for easy cleaning and refilling. Base is in two parts so that it too can be cleaned easily. Hangs from copper colored chain hanger. Copper bases design allows the little birds to perch while feeding through 8 opencut flower ports, Holds 550 cc of nectar.